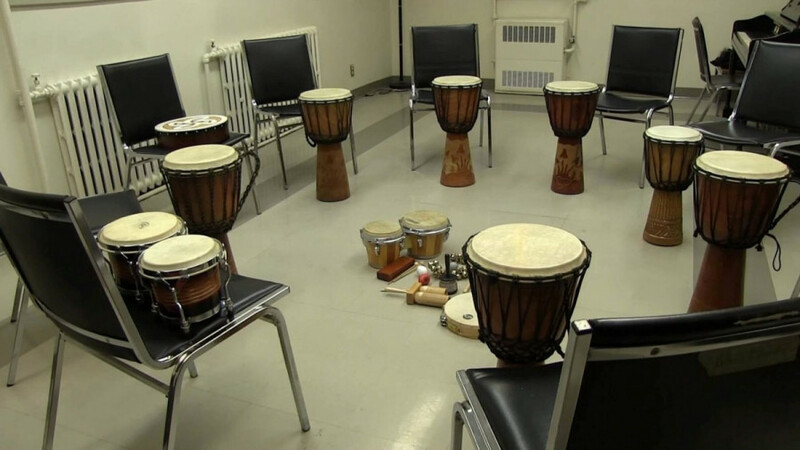 Concordia University’s Multi Faith & Spirituality Center hosts drumming sessions every Monday from 5 p.m. to 6 p.m. to combat stress in a friendly environment. In collaboration with the music department, Rev. Ellie Hummel and Dr. Irene Feher facilitate the drum circles with the help of the Centre’s department assistant, Belinda Maher. These drum circle sessions welcome students from every program to make music together, for an hour every week. Instruments like tuned bells and Persian drums are available at the session. Students can sit in a circle and play music, drumming and singing to their heart’s’ content. Hummel is a minister in the United Church of Canada and Feher is a classical singer, trained musician and music professor at Concordia. They both merged their skills last fall when Feher joined the MFSC to support Hummel’s musical weekly event. “I love the idea of making music more accessible to everybody, not only because it’s just fun making music with people, but hearing the potential and the genius come out of people,” said Feher. Feher explained that in 2015, she joined the non-profit organization Music For People, and since then, making music more accessible has been an important goal of hers. For her, one way to achieve this goal is through community events like her drum circle. “When I went to Music For People and felt my positive experience, I felt completely committed to the idea that music should be something positive in our life,” said Feher. Feher emphasized she’s not a music therapist and that these sessions are not therapy sessions, but nonetheless, it’s become a space where students can let go. “This is recreational music making and community music with the sole aim of allowing students to come together, make friends, be in-sound together, release stress and enjoy,” said Feher. On March 11, the studio room of the MFSC welcomed Concordia students from different disciplinary backgrounds such as political science, philosophy and film production. After having engaged in numerous improvised drum circle songs with the use of their voice, tuned bells, glockenspiels, Persian drums, and wooden flutes, students shared their thoughts on the session. “I feel like I woke up from a dream—it was journey. I came in really exhausted and stressed, and now I am leaving feeling like everything is going to be okay,” said Liv Kanoa Hussey, a film production student. It was her third time attending. “It’s a good study break honestly, I was really stressed about our assignment that is due tonight but now I’m not too worried about it anymore,” said Isabella Rose Serrano, a film studies major. It was her first time at the gathering. “You don’t really have a sense of time while doing this, and I don’t think I have been in that kind of moment all that much for a long time,” said political science and philosophy student Isaac Finkelstein, also a newcomer. Feher said Hummel plans on having the event continue through the next fall and winter semesters and that they both expect to see new faces at each future meeting. For information about the drum circle, visit their Facebook event page, or see them on 2090 Mackay St. (Z Annex), Sir George Williams Campus.